Last week I went to a small mining town called Roros in the Norwegian mountains. That make up the town. Most of these houses are about 300 years old. Although I’m sure they were considered to be the huts of the poor in those days. Even the rubbish bins on the streets were picturesque. All added to the enchantment. (At least for a couple of days). For more enchantment, please visit: Our World. 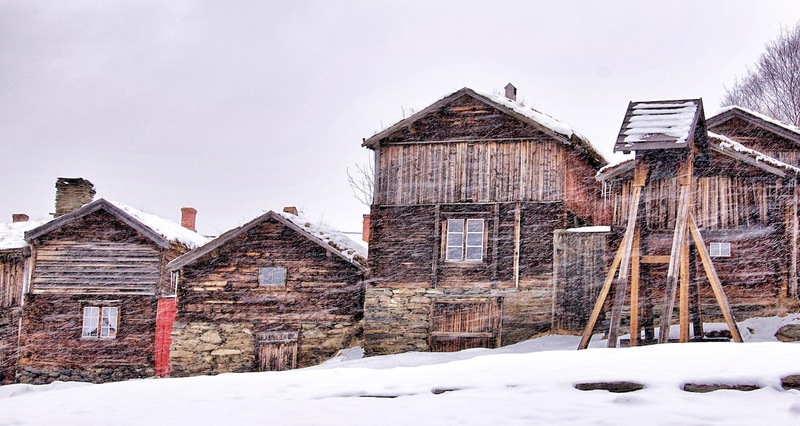 Posted in Culture, photographyTagged enchanted, mining town, Norway, Our World, Roros, Santa's sleigh, snow, winter, wooden housesBookmark the permalink. Wow, fascinating… Beautiful vista and architecture! Completely and totally charming. Do people live in those homes now? I’ll go to your link and read about it — just wanted to comment before I forgot where I was, which often happens when I start clicking. Wonderful pictures of what really does look like an enchanted fairyland. Thanks!! LOVE THIS! You’ve captured that “fairytale” perfectly! As I was viewing these, I felt like The Little Red Ridinghood! So charming! Love the red painted wood and how cool to find that sleigh!! Ha — that was your own link — I hadn’t even recognized it as the same place until I clicked and then I thought ‘of course !’….but I googled Roros and answered my question. Fascinating to think of living in the middle of a Heritage site like that! What a delightful and fun place to visit and so much history! 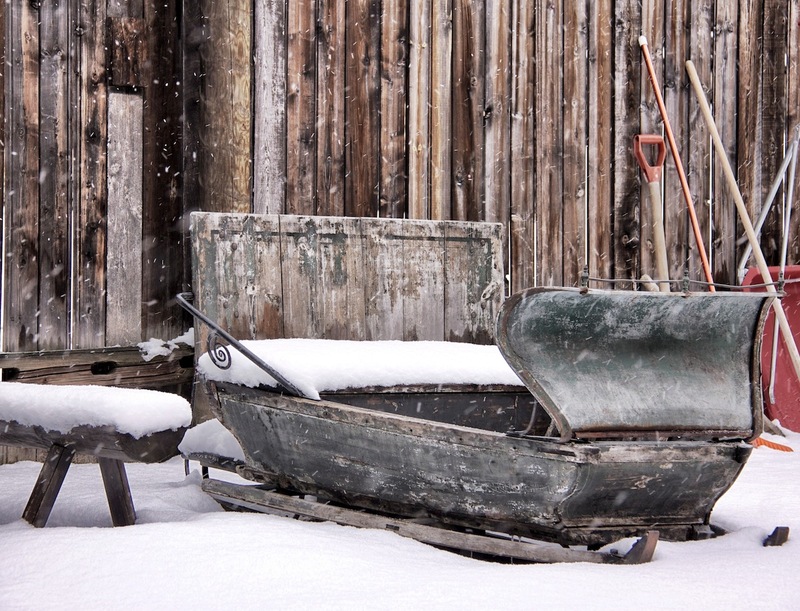 I love the red painted wood, too, and the sleigh is the perfect touch with all the snow! What a fun trip you had! Thanks for sharing it with us!! Enchanting! Beautiful shots! I especially love the red trim and the interesting shot looking down the side of the building. Lång tid, err nej se! Jag kanner mig mycket bra men jag är också så ofta trott efter skolan! wow, those buildings w/ red trim are gorgeous! snowfall makes it perfect. Wow! 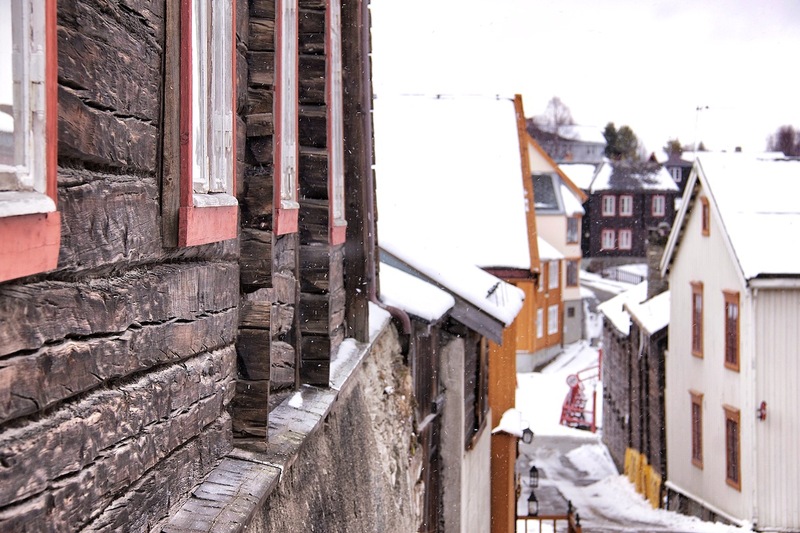 That’s still strong wooden old houses… these all put me spellbind! Its overall impressive esp. the Santa’s cart. such a fantastic village and great photo ops! Excellent photos, really a great success catching these beautiful homes. thanks for taking us to Roros 🙂 nice town! great shots! How beautiful those red-trimmed buildings look in the snow! Fabulous photos! Beautiful captures from this beautiful place ! It seems so remote and lonely. 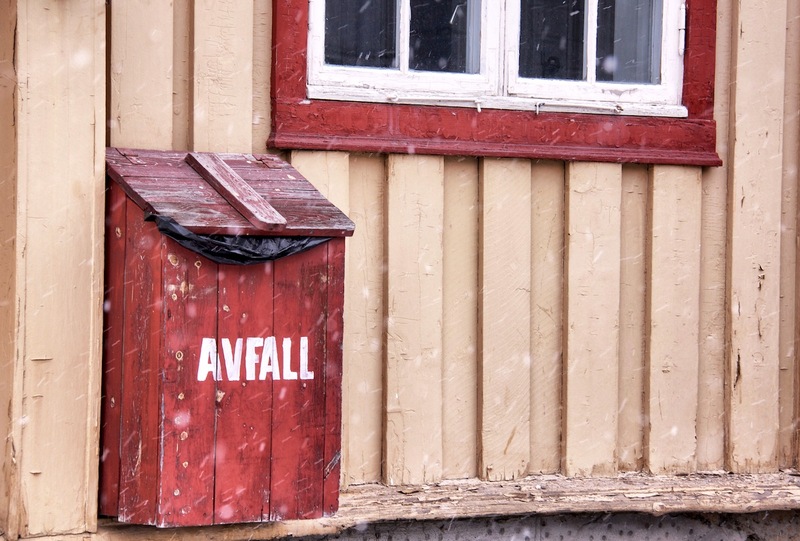 Gorgeous wooden buildings and even teh “Avfal” rubbish collector is made of wood and painted. gorgeous series of photos, so wonderful to see. thank you for sharing with us. I love that sleigh! Oh darlin’, it must of been amazin’ cause these pictures certainly are!!! Beautiful bunch of photos sweetie!!! I love this town. It has a magical quality to it. Your shots are always so good. The craftsmanship back then is a testimony to how well things were done. And your photos Fiona capture its essence so well! This is an enchanting spot. You have to wonder what kind of work goes into preserving 300 year old wood houses. No doubt a labor of love. I was pleased to read your comment about people living in the houses now, good to see them being appreciated and maintained. An interesting piece of history preserved. Nowadays ordinary people live inside those houses… although I expect that some of them are open during the tourist season. What an amazing place, and your photos show it off beautifully! Thank you so much for sharing these enchanting captures and their equally stunning location. Blessings for a great week Fi. LadyFi, your pictures speak a million words! It was like a ‘ Alice in Wonderland’ feeling to see these lovely pictures! You are so right about the enchantment. I also knew where you were coming from about those lovely cottages being ‘homes for the poor’. In the city in which I live the street which has the most expensive and upmarket homes (now) was first set aside as homes for the poor with extra land so they could grow their own vegetables. They really look like houses in fairy tales. I am curious what inside of the house is like. Enchantment, indeed. As much as I’m enjoying my spring, you sure have given us the beauty of winter. What a lovely setting. The deep red warms up that village! I would love to feel that snow. (I never thought I’d say that….) Thanks for a beautiful post. Thanks for sharing the wonderful images LadyFi. I would definitely want to go exploring there. Love those wooden structures and the red colors! 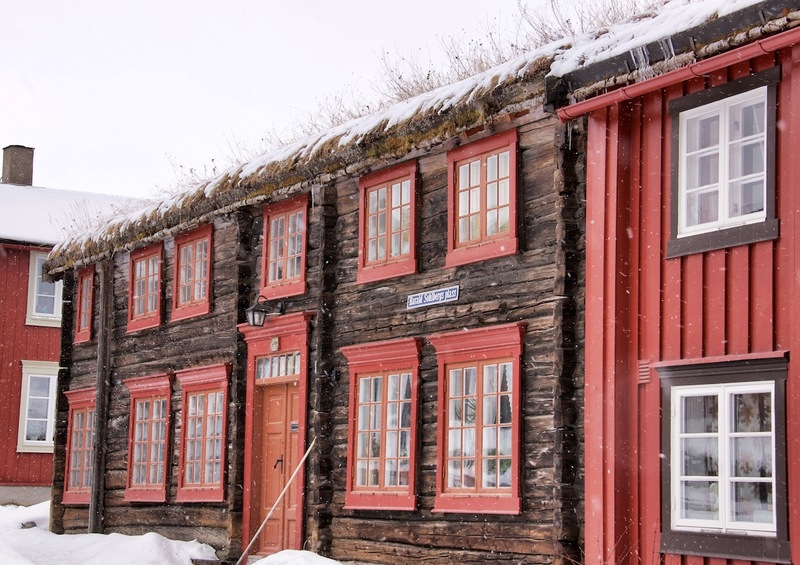 These pictures show perfect match of traditional old structures and snow. Who can resist their graceful charm!! I wish I could see them. I always love old wooden buildings. Fascinating photos as usual! What a magical place Fi ….. And to find the Real Santa’s sleigh must have been such a delight. Beautiful captures. Thanks for the enchanting pictures – I felt drawn back through time. New to the blog, liked your name from Jayne’s World and came over to read a post…love the Thoreau quote. Loved your pictures, especially Santa’s sleigh! It must have been an enchanted holiday for you! So much snow in April. Can you see the Northern Lights from there? Yes, you can see the Northern Lights up here. But we didn’t. Wonderful wooden houses. They look gret. Oh I have got to get to Roros!!! Your photos are just as I imagine Roros to be- magical!!! Still charming and looks young though old. Great shots. Looks like a great place to take a camera! They have nice detail and go well the snow. The houses save us from cold. gorgeous buildings! what a feast for the eyes!! fantastic captures, too. Fascinating place and lovely shots!! That was a really lovely post. What a superb setting for a fairytale! The aged wooden structures are all that ‘s left of copper miners’ dreams. The combination of brown, red, and white is beautiful. The snowfall was perfect in this enchanting village. It’s hard to believe that those beautiful buildings are 300 years old. Your photos are supurb. Thanks for sharing this fairy tale setting with us. These are such beautiful houses! Love every photo. These old houses if they could talk have certainly a lot of stories to tell ! Love the soft colours of the buildings…amazing place! It makes me so happy to see history preserved like this. What an enchanting little town. And I wouldn’t have gotten to see it without you. Thank you! I can see why you fell in love with these wonderful building! The color alone is already screaming charming, unique, and history! Very beautiful photos. I like the weathered wood on the buildings. You captured such beauty here in this magical place! Beautiful place and gorgeous pictures! You are right, this is a fairytale village. They are so damned good-looking. I’d definitely fall in love with them too. Lovely shots, those old houses look like they’ve seen some weather! Beautiful houses! So rustic! That snow was making me cold! 🙂 And the sleigh made me smile! What a wonderful looking place – the problem with this blogging lark is that the number of place you just ‘have’ to visit for real just keeps growing and growing!! Wow, it looks magical! Beautiful photos. The snow’s melted where I live, but I can practically hear the cold; it’s probably also warm in those houses though. Also, that quote by Thoreau — the one in the banner — has a nice pertinence to the mix of images and description.. Truly, you live in a fairy tale! Wow, amazing! I love this – so charming and such great detail in your photos. I’m drawn to the roof. It looks like many things are growing on top of the cottages. The first photo with the blowing snow is breathtaking! oh my word Fiona, I would have considered this heaven. You’ve captured the white, snowy, minimal beauty in all its magnificence. what fabulous shots. happy week to you. This place looks magical in the snow. You have captured the details beautifully. Perhaps you accidentally stumbled onto the North Pole instead! The color matching is excellent good for cinema. Thanks for sharing. Oh !!! This is fabulous, love this little city. Looks like a movie scene ! j’ai une préférence pour le quatrième cliché…. Unbelievable. Literally takes my breathe away. Thank you for sharing the amazing photos. They were like mini vacations.